There are two problems here: firstly, it’s been more than two years since Connex departed Melbourne, so why are their Rail Substitute Bus Stops still displayed at numerous locations around Melbourne, particularly as newer Metro signs can be found as well? 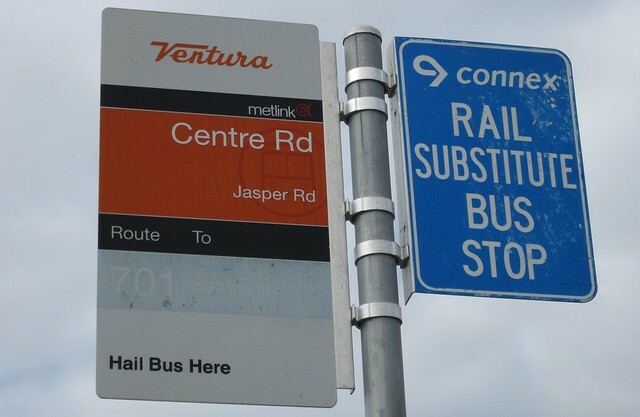 Secondly, and more seriously: Metlink’s standardisation of signage, and detailed bus stop signs and timetables on every metropolitan bus route were very welcome. But many bus stop signs are fading, and the route numbers and destinations are becoming very difficult to read. At some locations these have been re-done and are readable again, but there are still plenty of locations where it’s nearly impossible to see from the sign which bus departs from the stop.